For my inquiry I applied for a grant for are so I’m going to tell you guys about the project.The students at our school will be monitored and led by myself, Shauna Turner, and two other students, Hannah Brown and Sophia Draper. We will be the coordinators of the Inquiry Hub School Community Garden project. Our project has a parent sponsor, Arlyss Turner, who will be providing our team with guidance and support.The project will start on February 1 2013 and will end on June 2013. Our project focuses on the development of a garden to produce organic fruits, vegetables, and herbs. The aim of the project is to connect youth with the land by providing an opportunity to plant, grow and harvest their own food. Students will learn about the environment and agriculture by cultivating their own produce, a hands-on experience, rather than simply reading about it. In addition, the garden offers a place for students to interact and learn with each other and with partner groups. Partner groups may include the resident daycare, alternative education programs, and community residents, for example, senior citizens. Participants and partners will learn how to raise and take care of a garden, such as how to care for seedlings. Moreover, they will investigate and develop ways to grow plants faster and more sustainability Examples of inquiry include: Will growing strawberries along the ground be better than growing them vertically? Will growing tomatoes in a greenhouse all year long be better than leaving them in the open air? What is the relationship between pH levels of compost and plant growth? 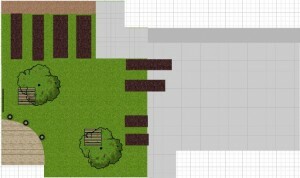 In the short-term, the garden will be a focal point of student activity. The garden can be described as an outdoor classroom that supports student learning in courses, such as science, but also serves as a source of inspiration for student-led research. In the long-term, the project will continue to function as new students assume responsibility for maintaining the garden. This project is important to the environment and the school community because it involves teaching students the importance of knowing what you eat and where it comes from. People benefit from trying home grown food because often the produce in stores are harvested when they are still green and they may not have all of the expected vitamins and minerals. They may also be chemically enhanced to make them bigger and last longer (i.e., exposed to fertilizers and pesticides). Moreover, produce may not taste as good picked 10 days ago in comparison to when it was just picked and ready to eat. Furthermore, there are several different kinds of fruits and vegetables that can be grown, yet they are not in our regular supermarkets, such as purple potatoes and white carrots which may be very nutritious and enjoyable to eat. This project is also very important because it will not only bring our school community together but also the community around the school. For example, children from the daycare at our school learning to care for plants to seniors sharing what they know about how to grow a garden. To get our school and classmates more involved we would divide different varieties of vegetables among us. Everyone would have a partner and be in charge of one vegetable for each pair. At the end of the year all pairs would teach us what they found worked and din’t work. First we are going to sign up for the encore program and a bottle drive. Then we are going to do other fundraisers for example like mother’s day plant sale. First of all, congratulations on getting the grant! 1. How has your ‘Seed to Sprout’ inquiry influenced your plans with this garden? 2. What is the next step as you move towards creating the garden? 3. Who in the community can we connect with to help us?